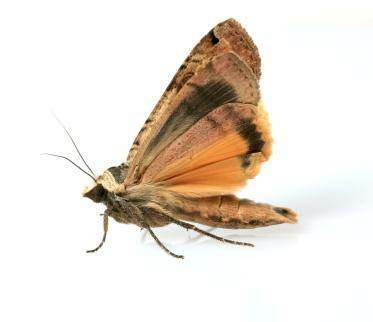 The most common type of food moth is the Indian Meal Moth, which is also sometimes call the North American High-Flyer. It is also the most destructive. The larvae are often referred to as “waxworms.” These moths are also known as flour moths or pantry moths. A female Indian Meal Moth can lay up to 300 eggs at one time. As adults, they grow to be about half an inch long. Fabric moths include species like the Webbing Moth and the Casemaking Moth. Both of these moths are only about one fourth of an inch long, and do not like to be seen, and rarely are. Generally, the only way you will know that these moths are present is when you see holes in you fabric.